Christmas is two days away. If you are still scrambling for gifts, let me help. 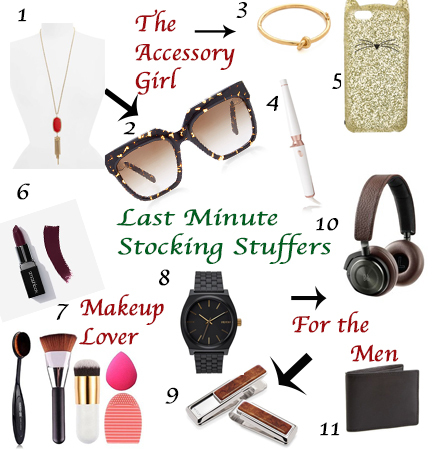 I have picked a couple of last minute stocking stuffer ideas that are sure to please. Looking for the perfect gift for that special man in your life? Try these headphones, which are great for travel, or these wood money clips. What about the beauty lover in your life.....this curling wand is very popular and this five piece makeup application and bush cleaner set (here) is great for someone just starting to wear makeup. Women love accessories so if you are at a lost for what to get her a necklace or bracelet is always a great idea. There are only a couple more hours left till Christmas so you better get shopping! What are some of your favorite gift ideas? Shop mine below.